George Saunders sets a high bar: His short stories, assembled in such fever-dream collections as Tenth Of December and Pastoralia, are feats of astonishing storytelling as much as they are the best satire of modern America. Saunders breaks with tradition in his new Lincoln In The Bardo, his first novel and a decided departure from previous works. Lincoln In The Bardo is a postmodern masterpiece. About half the novel is told through dozens of characters contributing to the narrative, which reads more like a tumbling conversation than a traditional single-character voice. The other half’s piecemeal approach is accomplished through an assemblage of real historical documents, mostly letters and memoirs from 1862, one year into the Civil War. 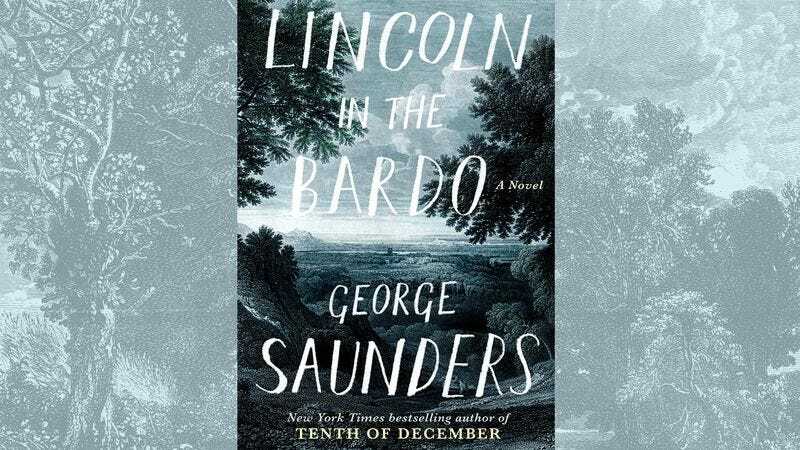 Saunders’ genius in Lincoln In The Bardo is the culminating effect of the disparate parcels of information that, taken together, create a spellbinding story of love and loss. Abraham Lincoln’s son has died. The entirety of Lincoln In The Bardo takes place over the course of a single night in the bardo—the Tibetan concept of the astral soul’s state after death, before rebirth, and combined here with a Christian idea of purgatory. Willie Lincoln is there, dead, in a ghostlike state with all the others who have died but not gone on. He’s visited by his father, still living, who returns to the cemetery after his son’s funeral. But the real main characters are hans vollman, roger blevins iii, and the reverend everly thomas (down-styled names replicated here in keeping with the text’s treatment of them, one gathers, to indicate their insubstantial, liminal states). It’s through these three characters that the story in the bardo unfolds, as they interrupt and speak over each other to describe what happens the night Willie joins them. Saunders is best known for his satirical bite, but Lincoln In The Bardo is a deeper examination of life, explored through the dead, unable to move on for various reasons. He’s never written anything quite so poignant and moving as this story about death. There is certainly surreal humor, with Saunders bringing his signature flair for drama and heightened silliness to the small anecdotes of the characters who hover between this world and the next, be it in the trio of bachelors who gallivant amid the graveyard and jauntily throw hats around or the phrase “matterlightblooming phenomenon” to describe the instant when individuals finally succumb to the pull of the next world, their shadows leaving the bardo forever. This is also a deeply moving story of accepting death. Tied to the cemetery they’re buried in because of their regrets, the dead characters fixate on the lives they stopped living, in some cases centuries ago. While Willie’s arrival in the bardo and Abraham Lincoln’s reluctance to leave the cemetery make up the novel’s action, the excerpts of letters and memoirs Saunders collects in interspersed chapters breathe life into history. Lincoln In The Bardo opens with various partygoers’ describing an extravagant event thrown at the White House while Willie Lincoln is upstairs, dying of typhoid. This narrative by way of historical snippets forms the state of Mary Todd Lincoln upon her son’s death, but they mostly focus on Abraham Lincoln—his relationship with Willie, his grief, his preoccupation with the war, and connecting the loss of his child to that of parents around the country suffering the same loss because of the war. It serves to transform a historical figure into a real, breathing man, bowed down by grief and unable, for a night, to leave his son’s final resting place. The audiobook is another marvel. Like the novel, it takes a chapter or two to get used to the format, but after a few minutes the piecemeal contributions flow into each other to create a cohesive story. The chapters of letter and memoir fragments describing the White House party, the Civil War, and the general states of Lincoln and Willie’s death feel elongated in the audiobook treatment. Pauses after each snippet for sources to be cited especially grind the narrative to a stutter. Still, it achieves the same end as it does in the novel, with each piece contributing to a larger point or state of mind. The bardo chapters are downright dazzling, with Nick Offerman, David Sedaris, and Saunders himself forming the main trio. Each actor deepens his character, their voices heightening them into people who feel even more real than in the book. The dozens of characters in the bardo are expertly cast, down to the minor players who only appear briefly to tell their sad stories. Miranda July adds great vulnerability to Mrs. Elizabeth Crawford, making that character far more memorable than she was in the printed version, for example, and Bill Hader and Megan Mullally are perfectly cast as a quarreling, drunk couple. Familiarity with the actors lending their voices to the audiobook at times heightens the story, like when public radio-personality Sedaris describes his character’s suicide as a result of being gay. Like the novel, the audiobook breaks new ground in what can be accomplished through a story. It helps that there’s not a single bad note in the cast of a whopping 166 people. It’s also the rare phenomenon of an audiobook being a completely different experience compared to the novel. Even if you’ve read the novel, the audiobook is worth a listen (and vice versa). The whole project pushes the narrative form forward. 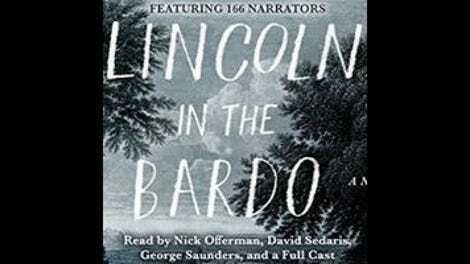 Purchase Lincoln In The Bardo here and the audiobook here, which helps support The A.V. Club.